This Sunday: Southern Oregon Wines Come to the PDX Park Blocks! 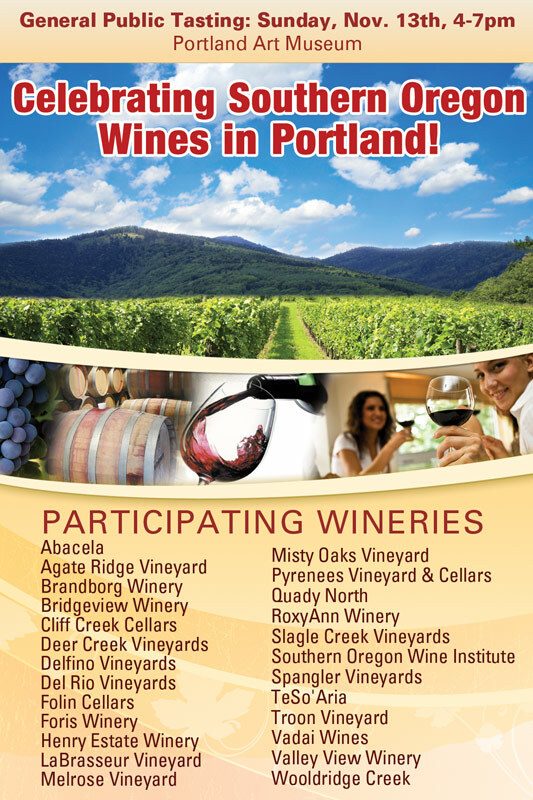 Yo PDX, the Southern Oregon wine scene is comin’ atcha! Over 25 Southern Oregon wineries will be representing their best at the Southern Oregon Winery Association's Grand Tasting event at the Portland Art Museum this Sunday, November 13th from 4 – 7pm. A perfect opportunity to find that there is in fact wine life, in Oregon beyond Pinot Noir. Our lovely neighbors to the South are producing an amazing array of warm weather varietals and are really making a name for themselves with Tempranillo and Zinfandel. You've got Pinot Noir coming out your pores, fact is, you need a Tempranillo cleanse. Southern Oregon is here to oblige you. Featured varietals, both unique and familiar, will include Albarino, Viognier, Roussanne, Malbec, Syrah and many more. Over 100 Southern Oregon wines will be offered, paired with appetizers, to make for a distinctive city tasting experience (and to soften the blow of the weekend... well, ending). 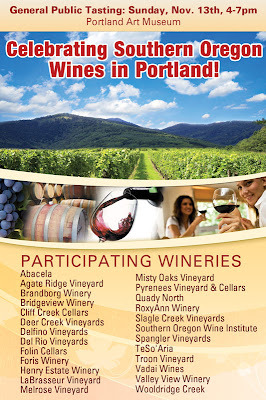 Tickets are $39 and can be purchased on the Southern Oregon Wineries website, or by calling (800) 781-9463. Feel like going for free? Enter to win a pair of tickets to this event by liking the Northwest Wine Anthem page on Facebook and watch for details on Thursday as to how you can win. Good luck, and happy tasting!